Nicholae Carnassi was born on Coruscant, circa 235 ABY. His father was a Senator’s primary aid, and spent most of each standard year away from Coruscant. His position within the Senate provided his family with enough financial support that his mother never had any need for employment, and in turn spent her time as a full-time mother to her children: Nicholae, and his younger sister Amelia. Nicholae spent his early childhood much as any other child within the political spectrum did; his time was split between private schooling, and family-oriented public service. When Nicholae turned ten years old, he was submitted for testing to the Jedi Order – as was standard practice on Coruscant. His testing yielded positive and promising results, and thereafter he called the Jedi Temple on Coruscant his home. Young Nicholae spent nearly a year in group training exercises and classes, until he was apprenticed to Jedi Master Shiin Lao in 246 ABY. He spent the next fourteen years at Shiin Lao’s side, learning from her living example and instruction. When Nicholae was twenty-four years old, Master Laos submitted him to the Council for his Jedi Trials. Two grueling cycles later, his Padawan braid was cut, and it was declared that he had passed the Trials. He was now Nicholae Carnassi, Knight of the Jedi Order. Nicholae spent most of his first two years as a Jedi Knight volunteering for rescue and humanitarian missions throughout the Galaxy. However, tragedy struck in 262 ABY, and Nicholae received a message from the Jedi Council, informing him that Master Shiin Lao had been killed – one of many casualties resulting from an explosion aboard a transport shuttle. 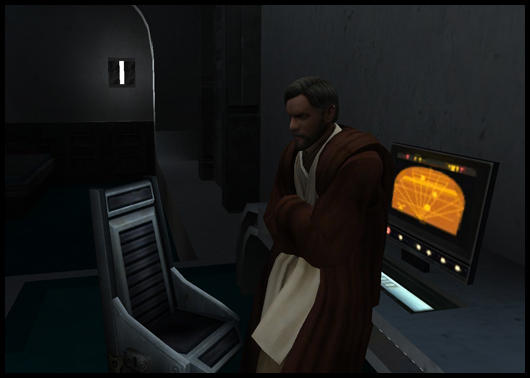 Nicholae returned to Coruscant and requested that he be allowed to finish training Master Lao’s padawan-learner, and the Jedi Council granted the request with hesitation. Despite the Council’s initial concerns over transferring padawan-learner Natala Ankh to Nicholae, the two turned out to be a solid pair. Nicholae’s familiarity with Master Lao’s style of training allowed for a smooth transition for Natala, and the two developed a sense of fraternity in a handful of cycles. Natala trained under Nicholae’s wing for the next ten years, until her master submitted her to the Jedi Council for the Trials. She passed with a mastery that left Nicholae proud, and ripples in the Force sent a warm reassurance to both of them that Shiin Lao shared the feeling. His first apprentice now adventuring through the Galaxy on her own, Nicholae turned his attention to a new group of initiates, recently arrived from various corners of the Galaxy. His eyes fell on a teenage boy from Glee Anselm. His request to apprentice the child was swiftly approved, and the training began. However, Jedi training proved to be too much for the Nautolan boy, and he was injured to the point of disability in a training accident. The boy was released from Nicholae’s care, and was transferred to the MediCorps to begin rehabilitation and medical training. Nicholae turned his focus next to instruction. He was nearing his forties, and felt that a change of pace would be a positive thing. He applied for a position teaching Force Mastery to the Temple’s Tier-2 students, and was granted the position. Five years passed as he instructed those teen-aged students that had not been chosen for apprenticeship, opening their minds to greater and greater possibilities within the Force. Out of these students, many were eventually taken as apprentices, or volunteered for the varied arms of the Jedi Service Corps. One student, however, refused to move on – Rylan Var. On one fateful evening after an extended lesson, Rylan shared his passion for teaching with Nicholae. Nicholae saw potential in Rylan, and with the Council’s blessing, took the young man as his third apprentice. Nicholae spent the next ten years training Rylan not only in the standard practices, but extensively in Force application and theory, as well as in theories of education. In the year 283, Nicholae saw in Rylan not only the solid foundation for a Jedi Knight, but a talent for instruction that had already begun to pass his own. He spent one final year rounding off Rylan’s training, then submitted him to the Jedi Council for the Trials. Rylan passed as expected, and on Nicholae’s insistence to the Council, was placed as the head of the Tier-2 Force Mastery class. The next five years saw Nicholae return to his championed cause, providing humanitarian aid on war-struck worlds, and rescuing those who sent for help from the Jedi Order. In the year 289, the Jedi Council acknowledged Nicholae Carnassi as Jedi Master, a testament to his steadfast dedication to the Jedi Order, the mastery he holds over his craft, and his resolved will to continually help those in need. Looking for a change in pace, Jedi Master Carnassi requested a transfer to the recently-established enclave on Alzoc III, and brought with him his compassion for life, and passion for the Force.